The four-year varsity player topped 1,000 career points on Jan. 18 against Woodbury High School. Standing about 6 feet tall, Haddonfield Memorial High School senior Mary Kelly is frequently the tallest player on the basketball court. However, when Kelly was a freshman three years ago, that wasn’t the case. 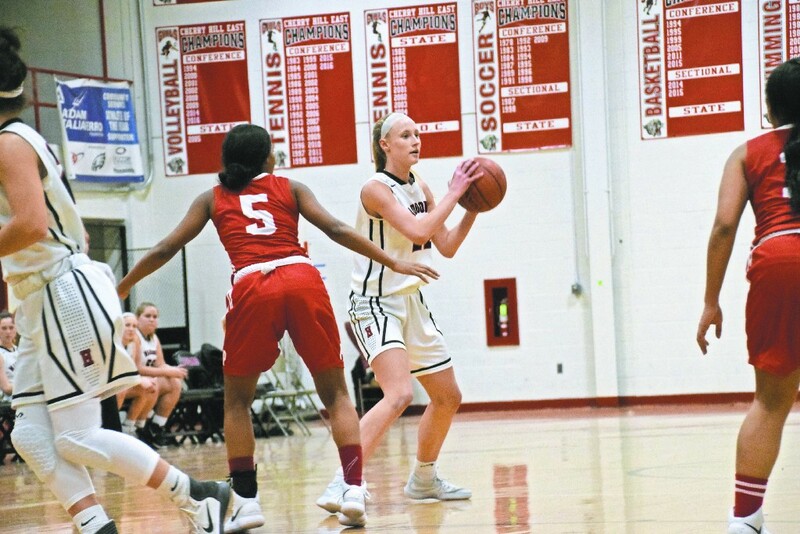 The progress Kelly made in her game freshman year helped set the stage for a long and productive high school career at Haddonfield. She has been one of Haddonfield’s top-three scorers each year she has been on the team. On Jan. 18, Kelly scored her 1,000th career point in the Bulldawgs’ 74–34 win over Woodbury High School. Kelly entered Haddonfield as a freshman with plenty of experience. In addition to playing with the youth program in town, Kelly also played at the Amateur Athletic Union with the Comets, a team based out of Philadelphia. Even with AAU experience under her belt, moving up to the high school level for the 2014–15 season was still a slight shock for Kelly. After making the varsity team as a freshman, Kelly found herself going up against players who were taller and older. However, the experience helped Kelly diversify her game. Kelly quickly developed into a consistent scorer for the Bulldawgs. She scored at least 200 points in her last three seasons and topped 300 points her sophomore and junior year. This season, Kelly is Haddonfield’s leading scorer, averaging 13.3 points per game. Some of Kelly’s favorite high school memories revolve around her long-time teammates. She shares a close relationship with fellow senior Annie Stanton. Like Kelly, Stanton made varsity as a freshman and the two have been on the same team together since childhood. Kelly also has fond memories of her sophomore year, when Haddonfield made a run to the South Jersey Group II championship game. Kelly’s favorite moment from her career was when the Bulldawgs upset top-seeded Cinnaminson High School on the road to reach the sectional final. Congrats to Mary Kelly of Haddonfield HS reaching a 1000 pts last night vs Woodbury. She can flat out play!! Scoring her 1,000th point was also something Kelly wouldn’t forget. Kelly entered the Jan. 18 game with 998 points, needing just two to reach the milestone. Because she was so close, Kelly had dozens of family members attend to witness the event. Kelly would end up sinking two free throws in the opening minutes of the first quarter to reach the 1,000-point mark. Kelly will continue playing basketball at Catholic University next season. The campus’ location just a few hours from Haddonfield was a big reason she chose the school. “I really liked how easy it was to get there. My parents will be able to see me play, my grandparents, and I just liked the D.C. area, and they have a good program,” Kelly said. Before she leaves Haddonfield, however, Kelly wants to help the Bulldawgs bring home a sectional championship. Haddonfield lost to Sterling High School in the sectional final two years ago and was upset at home in the sectional semifinals last year against Manchester Township High School.